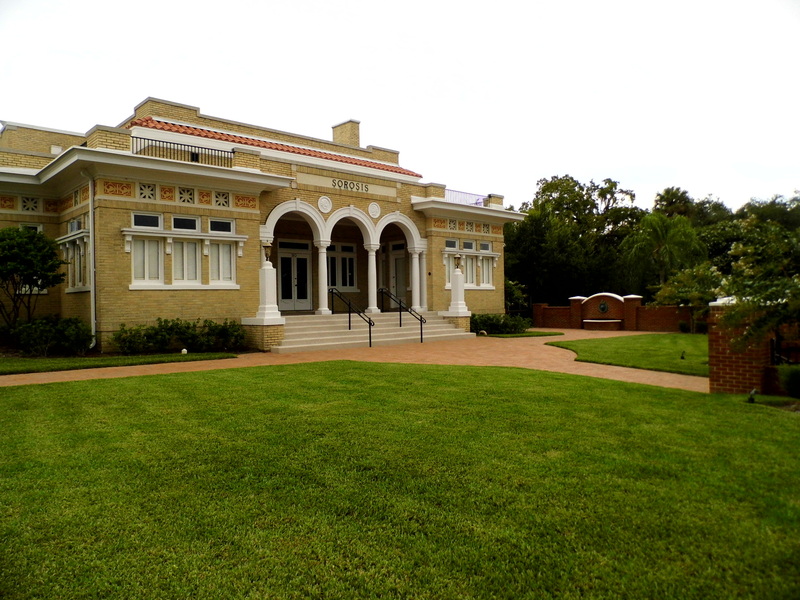 The Sorosis Club, a women’s club in Lakeland, was organized in 1922 and was named after the first incorporated women’s club in America, the Sorosis Club of New York, the original Club’s missions included service to the community, as well as social and cultural activities. In 1925 the Club purchased the land for the their new clubhouse. Plans for the Italian Renaissance building by W.B. Talley (1871-1956), a Lakeland architect, were approved in 1926, and construction was completed by N.L. Snelson in 1927 at a cost of $42,000. The building was the first community center in the City. The Italian Renaissance style was most popular in the United States between 1890 and 1935. Typical elements of the style include the symmetrical design on the front of the building, a flat roof with a low wall around it, wrought-iron railings, recessed porches with arches, and small classical columns. Goldenrod, the club flower of The Sorosis Club, are stenciled below the roof. Two large stone lanterns on each side of the front walk represent knowledge and leadership. The detailing of this building is unique in Lakeland, and unusual in the Central Florida region.